Revise your paper(s) according to the reviewers' comments. The 1st conference was held in Bali, August 2007, which gathered participants from 12 countries. 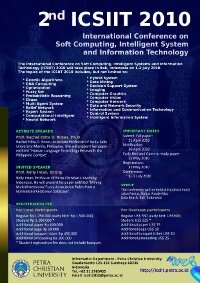 Following the success of the 1st conference, the 2nd conference is organized again by Informatics Department and Soft Computing & Intelligent System Research Group, Petra Christian University. The International Conference on Soft Computing, Intelligent Systems and Information Technology (ICSIIT) 2010 will take place in Bali, Indonesia on 1-2 July 2010. Prof. Rachel Edita O. Roxas, Philippine, "Human Language Technology Research: the Philippine Context"
Prof. Rolly Intan, Indonesia, "Mining Multidimensional Fuzzy Association Rules from A Normalized Relational Database"